The Clan Rose, descended from Hugh Rose of Geddes, came over from Ireland in the early 12th century. They were, before the forfeiture of the last Lord of the Isles, vassals of the old Earls of Ross. They are quite separate in origin from Clan Ross. Mr Hugh Rose, the geologist of the Kilravock Family, believed them to be English in origin because of their coat of arms which contains three bouggets (buckets) which was similar to the English family of Roos but this similarity was also carried by other families. The family of Rose of Kilravock (pronounced Ross of Kilraik) appear to have settled in Nairn, in the North of Scotland, in the reign of David the First, around the year 1219 when Hugh Rose of Geddes was witness to the foundation of the Priory of Beauly. The name Rose of Geddes changed to Rose of Kilravock when Hugh Rose of Geddes' son, of the same name, acquired the lands of Kilravock through marriage, Kilravock becoming the chief title of the family. The Roses enjoyed the friendship of the MacKintoshes from a very early date, and by an act of council dated 28th July 1643, 'The broken men of the name of Rose were bound upon MacKintosh who each ordained to be accountable for them'. The French Connection with the Rose of Kilravock family is with J.A. Rose who was an extraordinary player in the French Revolution. He was born in Scotland in 1757 and went to Paris in his early years. He became an Usher of the National Assembly but raised himself above that position to become closely related to distinguished figures of that eventful epoch. He was able to inform the unfortunate Louis the Sixteenth of his imminent demise and did likewise for Marie Antoinette. Therefore he was thought of as playing a better role than that of the fictional Scarlet Pimpernel. Other septs associated with Clan Rose are Barron, Geddes, Baron, Ross. BADGE: Ros-mhairi fiadhaich (Andromeda media) wild rosemary. As with many other clans of the north, the origin of the Roses of Kilravock has been the subject of considerable debate. It has been urged that the name is derived from the Gaelic" Ros," a promontory, in the same way as that of the Rosses farther north; but in Douglas�s Baronage the similarity of the coat armour of the chiefs to that of the Rooses or Roses of Normandy and England is taken as evidence that the race was of Saxon origin, and in his account of the house in Sketches of Early Scottish History, Mr. Cosmo Innes, who was closely connected with the family, and had made an exhaustive study of its charters and other documents, supports the Norman source. Innes declares the history of the house written in 1683-4 by Mr. Hew Rose, parson of Nairn, to be a careful and generally very correct statement of the pedigree of the family. The original patrimony of the Roses appears to have been the lands of Geddes in the county of Inverness. In the days of Alexander II., as early as 1219, Hugh Rose of Geddes appears as a witness to the founding of the Priory of Beaulieu, now Beauly. The founders of that priory were the Byssets, at that time one of the great houses of the north, the downfall of whose family forms one of the strangest stories of Alexander�s reign. The incident is detailed in Wyntoun�s Chronicle. In 1242, after a great tournament at Haddington, Patrick, the young Earl of Atholl, was treacherously murdered and "burnt to coals" in his lodging at the west end of that town. Suspicion fell upon the Byssets, who were at bitter feud with the house of Atholl. Sir William Bysset had just entertained the King and Queen at his castle of Aboyne, and on the night of the murder had sat late at supper with the Queen in Forfar. In vain the Queen offered to swear his innocence. In vain Bysset himself had the murderers cursed "Wyth buk and bell," and offered to prove his innocence by the ordeal of battle. All men believed him guilty. The Byssets saw their lands harried utterly of goods and cattle, and before the fury of the powerful kinsmen of Atholl, they were finally banished the Kingdom. Sir John de Bysset, however, had left three daughters, the eldest of whom inherited the lands of Lovat and Beaufort, and became ancestress of the Frasers, while the youngest inherited Redcastle in the Black Isle and Kilravock on the River Nairn, and married Sir Andrew de Bosco. Mary, one of the daughters of this latter union, married Hugh Rose of Geddes, and brought him the lands of Kilravock and of Culcowie in the Black Isle as her marriage portion. This was at the latter end of the reign of Alexander III., and from that day to this the Roses have been lairds of Kilravock in unbroken succession. No house in Scotland seems to have kept more carefully its charters and family papers from the earliest times, and from these Cosmo Innes derived many interesting facts for his sketch of the intimate customs and history of this old Scottish family. From a very early time, even before there is evidence of their lands having been erected into a feudal barony, the Roses were known as Barons of Kilravock. They were never a leading family in the country. 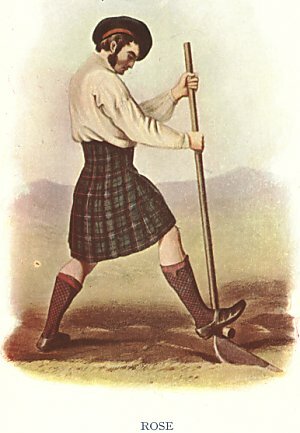 The heads of the house preferred to lead a quiet life, and though by marriage and otherwise they acquired and held for many generations considerable territories in Ross-shire and in the valleys of the Nairn and the Findhorn, we find them emerging only occasionally into the limelight of history. For the most part the Roses intermarried with substantial families of their own rank. William, son of the first Rose of Kilravock, married Morella or Muriel, daughter of Alexander de Doun, and Andrew, his second son, became ancestor of the Roses of Auchlossan in Mar. William�s grandson, Hugh, again, married Janet, daughter of Sir Robert Chisholm, Constable of Urquhart Castle, who brought her husband large possessions in Strathnairn. This chief�s grandson, John, also, who succeeded in 1431, married Isabella, daughter of Cheyne, laird of Esslemont in Aberdeenshire, and further secured his position by procuring from the King a feudal charter de novo of all his lands. It was John�s son Hugh who built the existing old tower of Kilravock in 1460, and his energy, or his need for protection, is shown by the fact, recorded as marvellous, that he finished it within a year. The family at this time was at serious variance with one of its most powerful neighbours, the Thane of Cawdor. This Thane�s father, six years earlier, had built the present keep of Cawdor Castle, and Thane William himself had made one of the best matches of his time by marrying a daughter of Alexander Sutherland of Dunbeath, whose wife was a daughter of one of the Lords of the Isles. Thane William was an ambitious man. He had his estates changed into a Crown holding by resigning them into the hands of the King and procuring a new charter, and, to make sure of the permanence of his family, he set aside with a pension his eldest son, William, who had some personal defect, and settled the whole thanedom and heritage of the family on his second son, John, whom, to close the feud between the families, he married to Isabella, daughter of Rose of Kilravock. The marriage, however, was not happy, and out of it arose one of the most curious romances of the north. The young Thane John did not long survive his marriage; he died in 1498, leaving as sole heiress to the Cawdor estates an infant daughter, Muriel. The old Thane, William, and his four sons were naturally furious. They did their best to have Muriel declared illegitimate; but their efforts were useless. By reason of the new charter the child was a ward of the Crown, and the Earl of Argyll, who was then Justiciar of Scotland, procured her wardship and marriage from James IV. The Roses were no doubt glad to have the keeping of the child entrusted to so powerful a guardian, but old Lady Kilravock was evidently not without her doubts as to the good faith of Muriel�s new protector. When the Earl�s emissary, Campbell of Inverliver, arrived at Kilravock to convey the child south to Loch Awe, the old lady is said to have thrust the key of her coffer into the fire, and branded Muriel with it on the thigh. Inverliver bad not gone far on his way to the south when he was overtaken by the child�s four uncles and their following. With shrewd ability he devised a stratagem. Sending Muriel off hotfoot through the hills under a small guard, he dressed a stook of corn in her clothes, placed it where it could be seen by the enemy, and proceeded to give battle with the greater part of his force. Seven of his sons, it is said, fell before he gave way, and even then he only retired when he felt sure the child was far beyond the reach of pursuit. When someone afterwards asked whether he thought the prize worth such sacrifice, and suggested that the heiress might die before reaching womanhood, he is said to have replied, "Muriel of Cawdor will never die as long as there�s a red-haired lassie on the shores of Loch Awe." Muriel, however, survived, and indeed lived to a good old age. The Earl of Argyll married her when twelve years old to his second son, Sir John Campbell, and the Earls of Cawdor of the present day are directly descended from the pair. Hugh Rose of Kilravock, grandson of him who built the tower, for some reason now unknown seized William Galbraith, Abbot of Kinloss, and imprisoned him at Kilravock. For this he was himself arrested and kept long a prisoner in Dunbarton Castle, then commanded by Sir George Stirling of Glorat. A deed is extant by which, while a prisoner, in June, 1536, the laird engaged a burgess of Paisley as a gardener for Kilravock�"Thom Daueson and ane servand man with him is comyn man and servand for all his life to the said Huchion." The next laird was known as the Black Baron. He lived in the troublous time of the Reformation, and in his youth he fought and was made prisoner at Pinkiecleugh; yet he managed to pay his ransom, 100 angels, and to provide portions for his seventeen sisters and daughters, built the manor place beside his ancient tower, and reigned as laird of Kilravock for more than fifty years. It was in his time that Queen Mary paid her visit to Kilravock. The Castle of Inverness, of which the Earl of Huntly was keeper, had closed its gates against her and her half-brother, whom she had just made Earl of Moray, and the Queen, while preparing to storm the stronghold, took up her quarters at Kilravock. Here possibly it was that she made the famous remark that she "repented she was not a man, to know what life it was to lie all night in the fields, or walk the rounds with a Jack and knapscull." A few days later, overawed by her preparations, the captain of Inverness Castle surrendered and was hanged, and shortly afterwards the Queen defeated Huntly himself at Corrichie, and brought the great rebellion in the north to an end. The Black Baron of Kilravock was justice depute of the north under Argyll, sheriff of Inverness and constable of its castle under Queen Mary, and commissioner for the Regent Moray. He lived to be summoned to Parliament by James VI. in 1593. In the time of the eleventh and twelfth Barons we have pictures of Kilravock as a happy family house, where sons and grandsons were educated and brought up in kindly, wise, and hospitable fashion. The thirteenth baron, who died young in 1649, was well skilled in music, vocal and instrumental. Hugh, the fourteenth baron, lived through the trying times of Charles II. and James VII., but, though sharing his wife�s warm sympathy with the persecuted Covenanters, managed himself to avoid the persecutions of his time. The fifteenth baron, again, educated in a licentious age, began life as a supporter of the divine right of kings, but afterwards admitted the justice and necessity of the Revolution. He voted against the Act of Union, but declared openly for the Protestant Succession, and, after the Union, was appointed one of the Scottish Commissioners to the first Parliament of Great Britain. 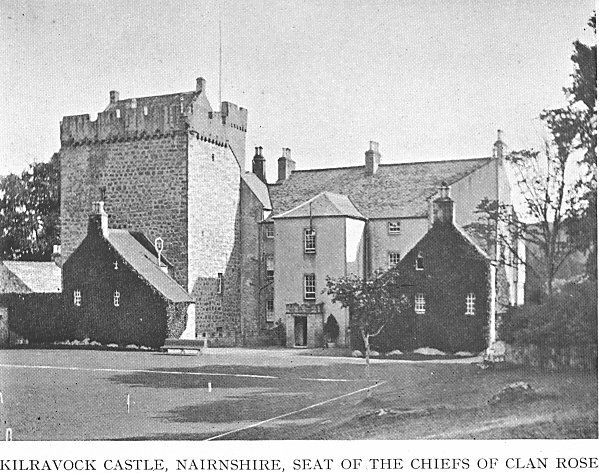 On the outbreak of the Earl of Mar�s rebellion in 1715 he stood firm for King George�s Government, armed two hundred of his clan, kept the peace in his country side, and maintained Kilravock Castle as a refuge for persons in dread of harm by the Jacobites. He even planned to reduce the Jacobite garrison at Inverness, and, along with Forbes of Culloden and Lord Lovat, blockaded the town. His brother, Arthur Rose, who had but lately been ransomed from slavery with the pirates of Algiers, and whose portrait in Turkish dress may still be seen at Kilravock, tried to seize the garrison. At the head of a small party he made his way to the Tolbooth, but was betrayed by his guide. As Rose pushed past the door, sword in hand, the fellow called out "An ehemy! an enemy I" Upon this the guard rushed forward, shot him through the body, and crushed the life out of him between the door and the wall. On hearing of his brother�s end, Kilravock sent a message to the garrison, ordering it to leave the place, or he would lay the town in ashes, and so assured were the governor and magistrates that he would keep his word that they evacuated the town and castle during the night, and he entered and took possession next day. In 1704 Kilravock�s following was stated as five hundred men, but in 1725 General Wade estimated it at no more than three hundred. In 1734 the sixteenth baron was returned to Parliament for Ross-shire, and he might have been elected again, but preferred the pleasures of country life. He built the house of Coulmonie on the Findhorn, and married Elizabeth Clephane, daughter of a soldier of fortune, and friend of the Countess of Sutherland. He was engaged in the quiet life of a country gentleman, hawking and shooting and fishing, when in 1745 the storm of Jacobite rebellion again swept over the country. Two days before the battle of Culloden, Prince Charles Edward rode out from Inverness to bring in his outposts on the Spey, which were retiring before Cumberland�s army, and he spent an hour or two at Kilravock Castle. He kissed the children, begged a tune on the violin from the laird, and walked out with him to see some plantations of trees he was making. Before leaving he expressed envy of the laird�s peaceful life in the midst of a country so disturbed by war. Next day the Duke of Cumberland arrived at the Castle, where it is said he spent the night. His boots, a pair of huge Wellingtons, are still to be seen there. In course of talk he remarked to the laird, "You have had my cousin here?" and on Kilravock hastening to explain that he had had no means of refusing entertainment, the Duke stopped him with the remark that he had done quite right. The laird was then Provost of Nairn, and a silver-mounted drinking cup of cocoanut still preserved at Kilravock bears the inscription, "This cup belongs to the Provost of Nairn, 1746, the year of our deliverance. A bumper to the Duke of Cumberland." For a hundred years the Sheriffship of Ross had been all but hereditary in the family, and after the abolition of heritable jurisdictions in 1746, Hugh Rose, the seventeenth baron, was still appointed sheriff depute by the King. Books and music, gardening and hospitality, filled up the pleasant life at Kilravock in this laird�s time. He himself was a good classical scholar, and was consulted constantly by Professor Moore, of Glasgow, regarding his great edition of Homer. It was the daughter and heiress of this laird who was known in so much of the correspondence of the north in her time as Mrs. Elizabeth Rose. This lady succeeded her brother, the eighteenth baron, in 1782, married her cousin, Hugh Rose of Brea, the heir-male, and lived through a long widowhood till 1815. Lady Kilravock, as she was called, had a high reputation for taste in music and literature, and when Robert Burns set out on his Highland tour in the autumn of 1787, he carried an introduction to her from her cousin, Henry MacKenzie, the "Man of Feeling." The Poet�s two visits to the castle within a couple of days of each other are noted in his journal, and referred to in a letter in the following spring. Below the crag on which the castle stands, winds the wild sequestered path known as the Fairy Walk, on which Burns is said to have rambled with the ladies of the house. The highly accomplished character of Mrs. Elizabeth Rose is also attested in the writings of Hugh Miller and other well-known authors. From first to last, indeed, the Roses of Kilravock stand distinguished among the chiefs of Highland clans for their refined and literary taste. Something of the popular impression of this is to be seen in the well-known ballad of "Sir James the Rose," which had probably some member of the house for its subject. Major James Rose, the late laird and head of the house, was Lord-Lieutenant of Nairnshire from 1889 to 1904. His son, the present laird, Colonel Hugh Rose, had just retired from active service in the Army when the Great European War broke out in 1914. He then again offered his services, and shortly after the beginning of hostilities was appointed Camp Commandant of one of the divisions of the British Expeditionary Force in France. Among other distinguished holders of the name in recent times have been William Stewart Rose, the well-known scholar, poet, and friend of Sir Walter Scott, and his nephew, Hugh Henry Rose, Lord Strathnairn, who won his way by distinguished services in India to the position of Commander-in-Chief in that great dependency.